Biking is a great way to explore the great outdoors. The Cades Cove loop not only allows bikers, it encourages it with some of the nicest biking you will ever find including a place to rent bikes if you don't wish to bring your own to the national park. 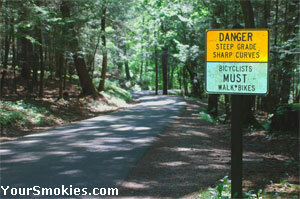 Unfortunately most of the Great Smoky Mountains national park is not conducive to bike riding. Heavy traffic, steep grades, and blind curves throughout the Smoky Mountain National Park make bicycling unsafe in all but a few areas and off road biking is not allowed on any hiking trails other than the Gatlinburg Trail in Tennessee and the lower Deep Creek Trail, and the Oconaluftee River Trail. Looking to take a small spin on your bike and not go very far in the park? The campgrounds allow leisurely bike riding, but you won't go very far, nor should you ride fast on the campgrounds. The 11 mile Cades Cove loop has rolling hills and steep grades and there are at least 2 places when you must walk your bike in order to avoid serious injury. While a bike ride on this road is considered safe, people who have physical limitations should be sure of their ability to complete the section of the loop they will bike or have a vehicle follow them. Tennessee law states that bike riders 16 years old and younger must wear a helmet when riding a bike. Due to potential danger of the road, it is strongly suggested that all riders wear a proper biking helmet. 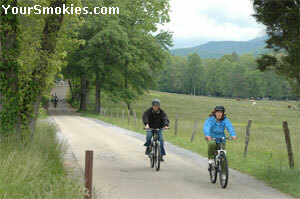 For most riders, the full Cades Cove loop takes at least 2 hours to complete, most riders take 3 to 4 hours. Make sure to not start the ride too late in the days as the Cades Cove loop is not lighted so it is only safe to ride during the day time. To make your ride even more special, start early in the morning Wednesday or Saturday when the roads are closed to vehicular traffic until 10:00 am (mid May to late September). Bikes for adults and children can only be rented in the park at the Cades Cove Campgrounds Store which is near the Cades Cove Campgrounds. The Cades Cove Campgrounds Store is Open. Campgrounds Store Hours in April are 9 am to 5 pm. You can rent a bicycle from March 15th to May 31st from 9 am to 2:30 pm, June 1st to September 1st from 9 am to 4:30 pm and September 2nd until November 4th from 9 am to 2:30 pm. The last rental must start before 2:30 pm and the Cades Cove store does not rent bikes late in the fall and in the winter as it is closed. If you are planning to rent a bike in Cades Cove, each individual rider must sign their own paperwork and bike riders under 18 years old must have a responsible adult sign the rental paperwork in order to rent a bike. The Cades Cove store can be reached at (865) 448-9034. Outside of the main areas in the park, there is a nice bike trail which starts near the park entrance in Townsend Tennessee and Lakeview Drive. Cataloochee Valley in North Carolina is also exceptional. Other safe areas for biking include Tremont and Greenbrier roads in Tennessee. Outside of the Smoky Mountain National Park and the immediate areas the Chattahoochee, Cherokee, Nantahala and Pisgah National Forests, and the Mount Rogers and Big South Fork National River Recreation Areas all have Mountain biking trails.